Apple Launched Iphone 6 few days ago and See Iphone 5s its previous Flagship got a extreme Price drop and Is available at Rs 31,999 /- Indian Rupees and more over its Iphone 5s 16 GB variant . Iphone 5s comes with 4.0 inch IPS display with a 8 megapixel of Rear camera and 1.2 megapixel of Front camera , Both the camera's gives really awesome pictures . Iphone 5s is available in three Colors - Black , Golden and Silver with a premium design . 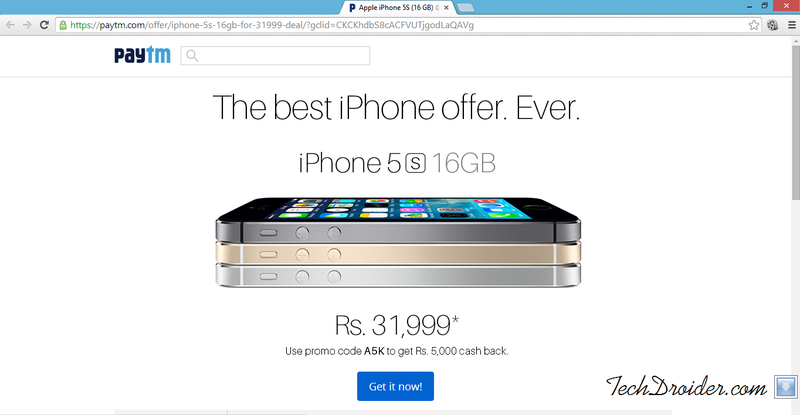 As now it is up gradable to Ios 8 .
and Use This Promo Code - A5K and Avail the offer .